You’ll need a camera: A DSLR works best. Of course you can try some of these techniques with at point-and-shoot, but it’s a lot harder without having manual controls. 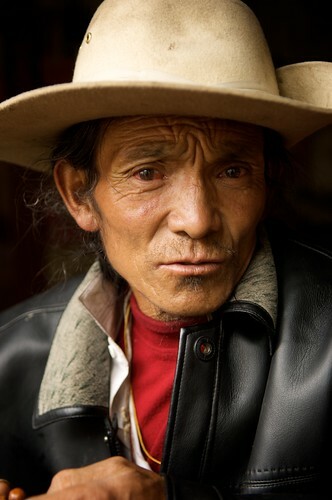 The best lens for portraits is usually considered to be about 90mm. I think that’s true, but I usually find myself shooting with a shorter lens, say a 24-70mm (set at 60-70mm) or often I’ll use a 50mm f1.4. Portrait opportunities often turn up at unexpected times, and the 24-70 and 50mm are my “walk around” lenses – the ones that are usually on the camera when I’m wandering the streets, so if I see a good portrait I don’t worry about changing lenses, I start to think about how I’m going to capture it. Camera settings: If you’re wandering around, walking through different lighting conditions, your camera should be set to handle whatever you might throw at it without you having to think about it. I always walk around with my camera set to “aperture priority”, “auto ISO” and lately I’ve been using “auto white balance” as well. All that allows me to to keep my aperture at a pretty good setting for all conditions, (maybe f5.6) and if I need to, I can quickly open the aperture or close it down by only turning one dial. That works pretty well for me for most conditions, taking pictures of temples, markets, mountains, etc., but when it’s time to take a portrait, I’ll change those settings a little bit. 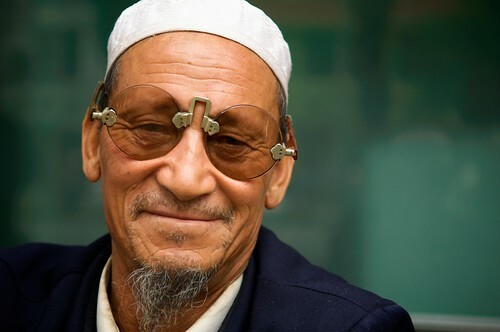 Xining, China - This man was just sitting in the perfect place. I walked by him, took a few seconds to get the nerve to ask, and shot 3 frames. As I walk over to whomever I want to photograph, I’ll adjust the aperture dial to a very wide setting. If you’re shooting with a lens that has a variable maximum aperture, open it all the way up. That means to set the aperture to the smallest number, f3.5 or whatever it might be. If you have a lens with a max aperture of f2.8, set it to that. I often shoot portraits with a prime lens 50mm f1.4, but in this case I don’t usually open it all the way. I find that the depth of field is too narrow at f/1.4 and sometimes I’ll mess up a photo because it’s not in focus. But before you change the settings, you’ll need to find someone interesting: “Interesting” people don’t have to really look interesting, although it doesn’t hurt. You can take a fantastic portrait of someone that looks normal and a terrible portrait of someone that looks interesting. My basic advice would be to take lots of portraits of lots of people, and sort them out later. To find people to photograph, I use two different techniques. One I’ll call The Hunting Approach, and the other The Trapping Approach. 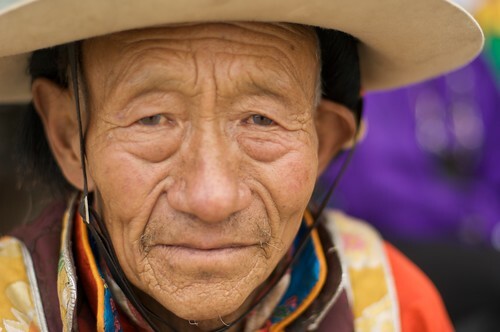 So… You’re walking around, taking pictures of temples and flowers and clouds and stuff when you see an amazing Tibetan Monk walking down the street near you. What do you do? Quickly run over and ask to take a picture? NO! Before you even approach him, look for something that will make a good background. It could be a plain wall, an empty field or a dark hallway. You need to find something simple that will not take the viewer’s attention away from the face of your subject. It should also have some nice light. You don’t want to take a portrait in direct sunlight. Find some open shade or an open window. I wrote another blog talking about how to use natural light for portraits, so I’m not going to spend too much time on it here. All that said, don’t look around for too long, your subject might wander away! The Trapping Approach: This approach is when you let them come to you. First, you find a place that has really nice light and a good background. Doorways work well. So do windows that aren’t facing the sun. Again, I explained how to find this nice light in a previous post, so I’m not going to go into too much detail here. What’s important is that it’s near a street or square or market that has a lot of interesting looking people walking around. Then you simply ask people if you can take their picture and have them stand where you want them. If I find a really good spot, I’ll stand there for an hour or two and shoot lots of different people. I’ve actually had subjects come back to me a few minutes later with family members to photograph! 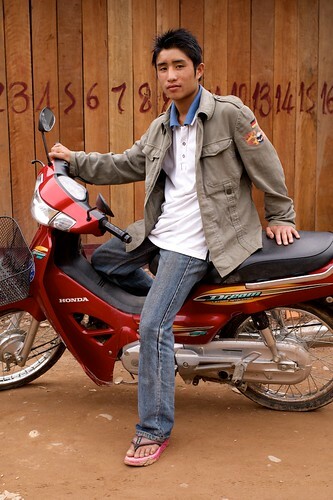 Muang Khoua, Laos - I noticed this cool background for a portrait about 1 second before this guy rode up, parked in the perfect place, and asked if he could practice his English. The Mental Game: If you’re a really outgoing person and have no trouble approaching strangers, skip the next few paragraphs. I’m going to spend a few paragraphs on the mental side. Like I said before, I’m a bit of a shy person. I’m not the kind of person that can walk right up and ask someone to take their picture. I always seem to have to convince myself to do it. I’ve even walked past the same person several times before getting up the nerve to ask them (Don’t even ask me about meeting girls!). But once you start doing it, it becomes a lot easier. Most People want to be photographed. It doesn’t matter if you’re in your home town or the other side of the planet, people want to have their picture taken. The reaction is different in different cultures, but I’ve rarely been refused. Sure there are some strangely-angry people out there who don’t want their picture taken, but usually, you’re going to brighten someone’s day by doing so. Think if a photographer from a far away land asked you… would you say no? Even if they say “no” that’s not the end. Besides the strangely-angry people, some shy people might tell you “no”. Don’t let that be the end. Usually, these people are just a bit shy and need some convincing. I’ve gotten on my hands and knees and begged… I’ve done little dances… I’ve pretended to cry… all with the hopes of making them laugh and having them say “yes”… and it often works! (But if you think I’m condoning harassing them, I’m not. Just give them give them an opportunity to reconsider.) It also helps to lighten the mood and show them that they mean more to you than just a passing thought. Yushu, Tibet - I was standing in this doorway to a hotel for at least 45 minutes before I could get someone to sit for me. I remember this woman walking by with her family and thinking "I'm not letting this one go!" It did take a few minutes of me and her family convincing her, but she eventually agreed to have her portrait taken. They said “yes”… Now what? Sit them down, or have them stand in the place you’ve found. Keep smiling because it will make them feel comfortable. Don’t ask them to smile. The photo might be better if you don’t, and you’re going to do something in 30 seconds that will make them smile. Spot meter on their face, on an area that’s not the brightest, not the darkest. If you don’t know what a “spot meter” is, don’t worry about it, use your matrix meter, today’s camera meters are pretty damn good. FOCUS ON THEIR EYES! This is probably the most important thing to any portrait. If you’re not focused on the eyes, the photo will look out of focus. Period. If you’re shooting with an aperture of 2.8 or faster, this point becomes even more important. Take a lot of photos. I usually take 3 to 5 frames really fast. Then I wait a second and take one or two more. Sometimes you get a nice change of expression if you do this. Show your subject the the photo on the back of your camera. This will almost always make them smile. You smile too, and tell them how great it looks. If they speak a different language, give them the “thumbs up”. Don’t let them leave!!! They are smiling a big smile because they probably never saw their picture on the back of a camera before! Take another picture! Also show any bystanders that might be hanging around. One of them might want to be your nextsubject. Lastly, if they ask you for a print, get their address and send them one! Nothing feels better for you and, if you’re traveling somewhere remote, they will probably only ever have one or two pictures taken of them in their whole lives! Give it to them! 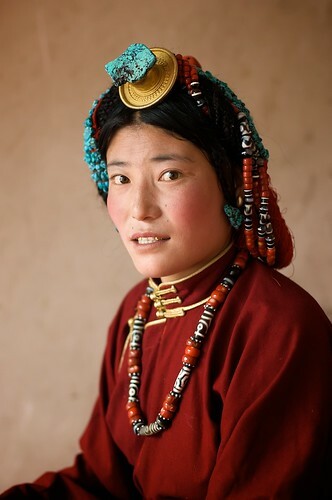 Tidrum Nunnery, Tibet - This man originally said no, but after 10 min of talking with his friend, he changed his mind, I fired off about 5 frames. All of them looked about the same except for this last one, when he gave me that interesting expression. That might all seem a little complicated, but once you start doing it, it becomes second nature. 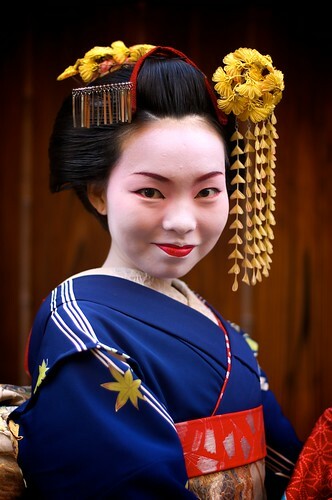 Learning to take portraits of people while traveling will add immense depth to your travel photography and cultural learning… Have fun! That is an extremely good article. Some good tips in there. Thanks! I know what you mean about approaching people. It is a scary thing. What about the model release form? How do you manage to persuade them to sign that? That is the part I struggle with too. Thanks Darren. For most of these travel portraits, I don’t get a release. As long as the photos are just used for editorial, you don’t need one. Thanks Neil! I’ve really struggled with taking portraits of strangers for a long time. Mostly I’m too nervous to ask people if I can take their pictures. I really like the travel portraits you’ve taken and it is quite comforting to know that it’s not easy for you to approach others as well. I have learned that practice makes perfect. I don’t shoot a lot of portraits like this when I’m in Taiwan. So when I go on a big trip, it often takes me a week or two to get comfortable with it again. Even then, I never feel 100% comfortable when approaching people, and I’ll almost always hesitate. But like I said, I’ve found that letting a good one get away without even asking hurts a lot more than asking and getting rejected. Love your work. This post reminds me of my first experience with asking a stranger if I could take their photo. I ran up to them, which startled them to begin with, and then in a loud voice, cuz I was scared to death, I said, “Can I shoot you?” needles to say, that didn’t work too well. Good luck in your ventures and thanks for the LinkedIn connection. I just discovered your blog through this article, and I’m stunned! Great pictures and great advices! I bought a 50 mm f1.4 lens a couple of years ago, and I never really had guts to shoot random people’s portraits… this article might help! Great article. Your work is amazing. I’m so bad at seeing natural light in this way. I have been struggling with this for so long. Thanks for the tips. Thanks Geo. Finding the light is definitely something that needs to be learned. Keep it up, and I’m sure you’ll get it! Great post! 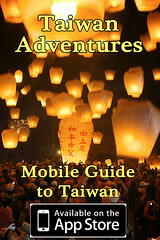 I chanced upon your blog looking for Taiwan pictures as I’ll be visiting for the first time next month and I have to say, awesome pictures as well as stories. I’ve been wanting to start a project shooting strangers but have been too fearful about approaching them so your tips are very helpful. Thanks for this! Thanks Joyce. Approaching strangers gets easier the more you do it. Have fun when you visit! Awesome tips! I’m not a shy person when it comes to just interacting with people, but when it comes to asking to take their photo, I hesitate. I also try to remember that it doesn’t hurt to ask! You’ve also got a great idea with the trapping bit. Genius! Thank you! All it take to approach people is a little practice, even for us shy people! This is a quote from a recent post on my own blog entitled “People like to be honoured”, which you might enjoy reading and which might prompt you to think a little more about how you interact with people when you travel and when you seek to take photographs. “If photography is about communicating an experience, and it is, then you need to have had the experience in the first place”. Better than “hunting” or “trapping”, think about “engaging”, “interacting” and “experiencing”. Hi Gavin, thanks for the thoughtful response. Honestly, I’m not sure what you’re getting at other than my clumsy use of a few words that were meant to be taken light-heartedly. As explained in the beginning, this is a post to help photographers APPROACH (and interact with) the people that they might like to photograph. It’s a post designed to help motivate photographers to interact with people they meet while traveling. I spent most of this post talking about the technical side of how to about take portraits such as this… I even explain that it’s a “scientific process” in the beginning. Nowhere do I mention the motivation behind why one might want to engage a subject, nor do I mention my motivation. An example that we agree on this subject is that your post implies that it’s bad for photographers to use 200mm lenses and not get engaged with their subject. I couldn’t agree more!!! That’s why this post is full of ways to get engaged with people and recommends using a very short focal length of 50mm. As a final note, if my obviously tongue-in-cheek titles of “hunting” and “trapping” are disturbing you that much, I apologise. I’m not the most eloquent writer and am learning all the time! Hey Neil…great post. I am an amateur shooter with way more passion for taking shots while travelling than any actual skill. I have been following your blog for a while and loved this post. It’s full of lots of great practical info that will help me develop my skills. Thanks for all your great photos and knowledge you’ve been sharing. Don’t worry about some of the overly critical posts about your choice of wording…we get what you’re saying and know you’re good intentions. Thanks Shawn. That’s good to hear at a time when people are attacking me all over the place. It’s times like this that I question why I even bother to try to help other people. If you have any other questions, please feel free to ask. Thank you for these techniques. I wandered over here in response to Mario’s post on IGVP, challenging you to rethink the “Hunting” and “Trapping” language/mentality. I humbly suggest “Seeking” and “Receiving” as replacement terms that more accurately reflect what the role of a photographer ought to be in front of reality. Nice one, thanks a lot for posting these quality photos.